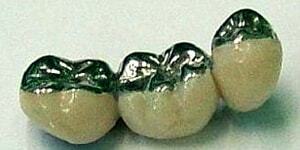 Dental composite resins are types of synthetic resins, which are used in dentistry as restorative materials. Modern composite materials have many applications in today's dentistry. Before we go to the clinical uses, let's first see the main advantages of composite materials. 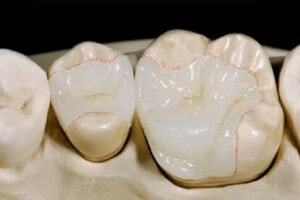 What are the main benefits of dental composites? 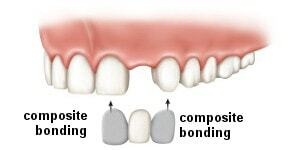 Dental composite chemically bonds to tooth structure. This strengthens the tooth's structure and restores its original physical integrity. Because composites are "glued" to the tooth, less healthy tooth needs to be removed for a composite restoration. Etching -- is performed with phosphoric acid that will produce enamel and dentin irregularities ranging from 5-30 micrometers in depth. Bonding -- a specific bonding agent is used for the operation. The bonding agent is supplied together with the composite. The bonding agent will secure a micromechanical bond to the tooth allowing good adhesion of the restoration to the tooth. The composite is finally placed and light cured. The fact that composite fillings are glued (bonded) to the tooth means that unlike amalgam fillings, there is no need for creating retentive features destroying healthy tooth. In this case, a composite false tooth is attached to the neighboring teeth with the bonding procedure. The main advantage of this method is that there is no grinding of neighboring teeth. A composite inlay is an indirect restoration (constructed at the dental lab) that will be bonded inside the prepared tooth cavity which will strengthen the entire tooth structure. A composite veneer may be directly placed (built-up in the mouth), or indirectly fabricated by a dental technician in a dental laboratory, and later bonded to the tooth. The main advantage of a direct dental composite over traditional materials such as amalgam is improved aesthetics. 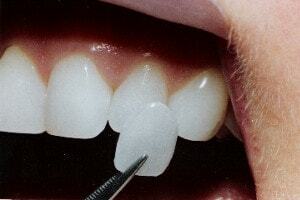 Composites can be in a wide range of tooth colors allowing near invisible restoration of teeth. Composite fillings can be closely matched to the color of existing teeth. When indirect restorations are involved, especially large ones, composite is the least ideal solution in terms of strength and durability. Even if today's composite materials can provide a life-like, beautiful appearance and can last for a long time, porcelain is more resistance to stain and chipping, it does not wear under pressure, is color stable and better aesthetically. However, composite restorations are normally cheaper. Direct dental composites are placed by the dentist in a clinical setting. 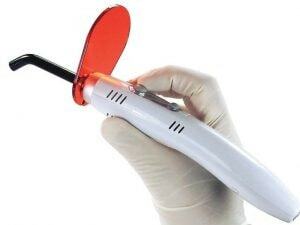 Polymerization is accomplished typically with a hand-held curing light that emits specific wavelengths to initiate the polymerization process. Direct dental composites can be used for filling cavities or small gaps between teeth, minor reshaping of teeth, to make teeth look longer or to change the shape or color of teeth. Indirect composites are cured outside the mouth, in processing units capable of delivering higher intensities and levels of energy than hand-held lights can. Indirect composites are cured for longer times and have higher levels and depths of cure than direct composites. Composite crowns are not as durable as gold, zirconia or porcelain crowns and do need to be replaced more often. Composite crowns can have a metal shell but there are situations when it is possible to manufacture full composite crowns. 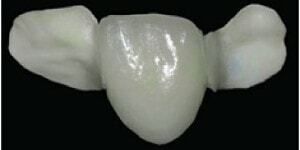 Metal-composite crowns are often made with a partial veneer that covers only the aspects of the crown that are visible. 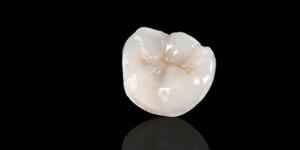 When aesthetic demands are high, it is possible to cover all sides of the crown with composite. Similar to crowns, composite dental bridges can have a metal shell on which composite is placed, normally in the form of veneers that cover the visible parts. Metal composite bridges have a similar structure to the crowns and are usually indicated when patients cannot afford or tolerate more expensive solutions. 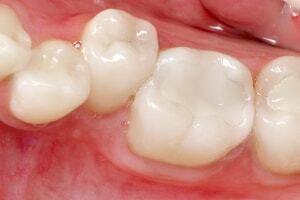 Adhesive composite bridges are utilized when a single tooth (normally front tooth) is missing. The procedure involves attaching a false composite tooth, that is modeled either by the dentist at the office or by the dental technician, to neighboring teeth with the bonding technique. The main advantage of this method is that there is no grinding of neighboring teeth. Therefore, the neighboring teeth are not damaged. This means that the patient can at any time revert to their natural teeth. Sometimes the composite bridge can be fiber-reinforced. A resin-bonded bridge looks and functions better than a removable denture but isn't as strong as fixed bridgework and typically doesn't function or last nearly as long as dental implants. An inlay is an indirect restoration consisting of a solid substance (as gold, porcelain or composite resin) fitted to a cavity in a tooth and cemented into place. Unlike gold and porcelain, composite inlays are attached inside cavities with the bonding technique. 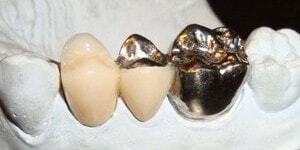 Although composite inlays are better held in place because of the bonding technique, they are inferior to gold and porcelain inlays in strength, durability and lifespan. A veneer is a thin layer of material placed over a tooth, either to improve the aesthetics of a tooth or to protect the tooth's surface from damage. There are two main types of material used to fabricate a veneer: composite and dental porcelain. A composite veneer may be directly placed (built-up in the mouth), or indirectly fabricated by a dental technician in a dental laboratory. The composite veneer will be fixed in place with the bonding technique. Porcelain veneers are more resistance to stain and chipping, more durable and are better aesthetically.